Trafalgar Wharf: What do you know about the National Coastwatch? NCI stations have been set up along the coast. Each station has a qualified and highly trained team to watch over its own particular area whether it's a popular seaside town, busy port or shipping area. Accidents will always happen at sea and along the coastline. Wherever there is an NCI station a watchkeeper will be looking out for danger and ensuring your safety on the water. Each station is manned by a team of fully trained and dedicated volunteers who keep a daylight watch up to 365 days a year. Stations are equipped with telescopes, radar, telephone and weather instrumentation, as well as up to date charts. A log of all water-based activities is kept during each watch and, when requested, weather conditions can be passed to yachtsmen and fishermen before they put to sea. Also with the new generation of web cams they can identify sea conditions for those who wish to check on the weather or sea state prior to doing any watersport activity, hopefully reducing the need for MCA response and RNLI call-outs. During each watch other activities such as canoeing and diving etc are closely observed, as are bathers, walkers and climbers who use the shoreline. Trafalgar Wharf & The Drystack's local station is at Gosport. You can receive radio checks and current local weather and sea conditions by calling on CH65 or by calling 02392 765194 during watch hours. A handy tip if you are planning a day trip on The Solent and you aren’t sure about the weather conditions. 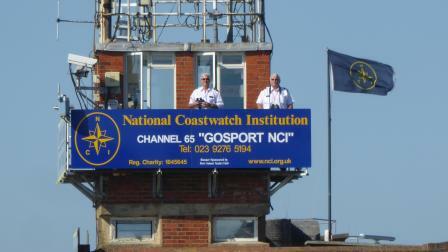 You can find out more about your local NCI and the National Coastwatch Institution in general by clicking here.